Do you know the feeling of sabotaging your own progress? Maybe it feels like a tug of war between DESIRE and FEAR? You intuitive know that you're meant to make a difference and you'd go make that happen. If it wasn't for these invisible cords that keep holding you back from going 'all in’. Your soul is calling out for you to step into your best self. Your soul knows that you're playing small and there is so much more you can be. Do you hear the call, but you don't know where to start? In order to attract all that you desire and to live your best life, you first need to give yourself permission to shine like the bright star that you are. You need to feel worthy of having all the good your heart desires (and knows you can have). The fastest route to stop self-sabotage and receive what you desire is cultivating a loving and supportive relationship with yourself. 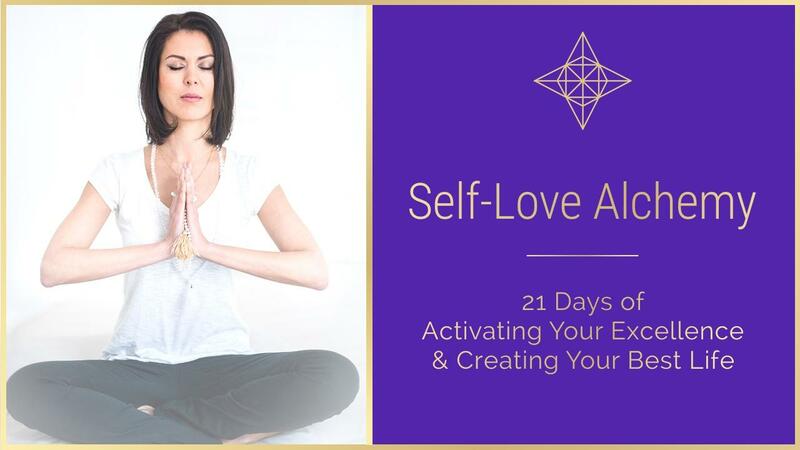 Self-Love Alchemy is an audio course that will guide you through healing meditations, transformational affirmations and goal setting stratgies so that you emerge in 21 days elevated in your energy, vision and self-love. This sets the solid foundation to creating your best life possible. Maybe you're on a path of awakening your spiritual and personal power. Then you already know your next level of happiness and fulfillment comes with loving and supporting yourself so that you can serve in a bigger way. "Get Self-Love Alchemy! It’s life-changing! 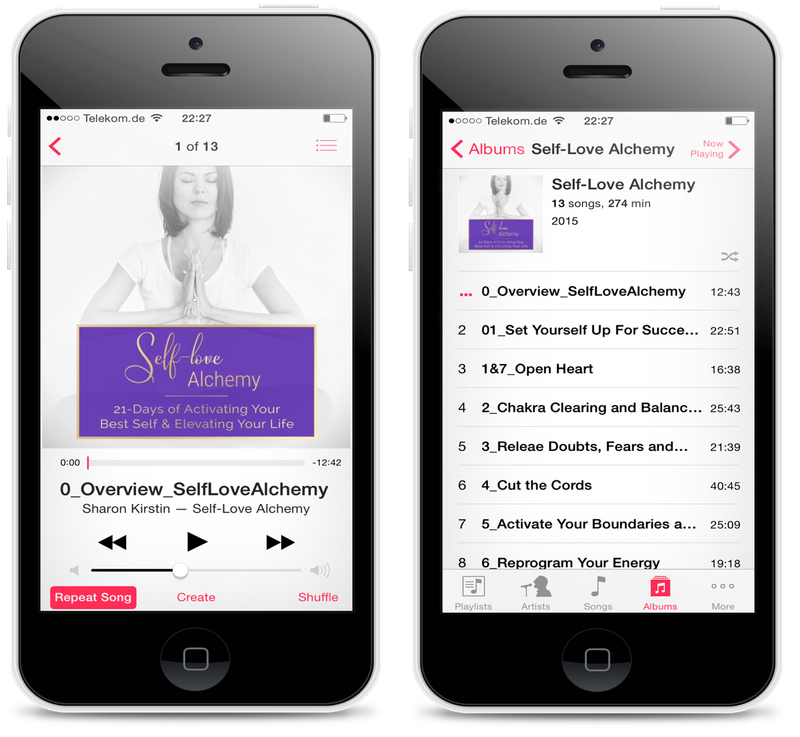 "After taking the Self-Love Alchemy course I attracted client work worth more than all client work before, combined!" - Ina E.
Activate your heart chakra and self love. Get in touch with your love energy and start feeling it in your body. Learn how to let love circulate in your energy and aura. Cleanse and balance all your chakras in a magical ritual with Archangel Raziel. Release stuck energies and blocks from your chakras. Learn how to let your chakras rotate and vibrate in their highest frequencies. Benefit: Balance and clear all energies in your body. Release past lives and memories from your chakras. The healing fairies help you release all doubts, worries or fears through their healing grid. Magical! Benefit: Understand limiting beliefs and transmute them back to love and light so you're ready and open to imprint new behaviors and energies in your energy field. Forgive yourself and others with the support of crystal healing, unicorns and Archangels Raphael and Chamuel. Effect: High-vibrational. Releasing. Healing. Freeing. Benefit: Deep forgiveness and cutting of old cords to make room for new inspired action. Travel to ancient Egypt and receive initiations from powerful goddesses Isis, Ishtar and Sekmeth. Heal your past lives, activate your loving boundaries and reconnect to your divine feminine strength. Benefit: Release old lives from your energy, strengthen your boundaries and reconnect to your divine feminine power. Travel to Ixchel’s healing temple together with Archangel Raphael. Receive profound healings down to a cellular level and start emitting a whole new electromagnetic signal to the field. Benefit: Reprogram your DNA and emerge with a new electromagnetic signature (completely changed energy field and aura). Reprogram your brain and behaviors by repeating the spoken affirmations. Enhanced with theta brain wave entrainment to facilitate fast and easy neuro reprogramming. Benefit: Change your thoughts to attract a new reality. Start each day with clarity, focus and productivity. Easily exceed your current performance, find hidden patterns and keep track of your success habits. You need to know where you are going so you don't miss the mark. This process will help you know what you want and how to make it happen. Transform your money story by understanding the relationship between money, power and self-love. 2 hours of video content taught via FB live.